This seems to preoccupy a lot of beekeepers and be the cause of a lot of chemical contamination in the hive, so let's address it here. First, understand that this is a very climate dependent issue. In a climate where you seldom if ever have a hard freeze the wax moths may live year round which will be an entirely different scenario than in a climate where you get hard freezes and a long winter. I will share what I do and how that works, but keep in mind you will need to adjust this to your climate and your situation and indeed, if you live where the wax moths never die from cold the method I use will not work at all and a different method will have to be used. First, let's talk a bit about the moths. Galleria mellonella (greater wax moth) and Achroia grisella (lesser wax moth). Both will invade unguarded comb during the season when they are active. They prefer comb with pollen in it and as a second choice comb with cocoons in it, but they will even live on pure wax with nothing in it. Most of my wax moth issues are when a walk away split fails to raise a queen and the hive dies, or a mating nuc dwindles too much to guard the comb well enough. I really don't have any other wax moth issues, but in the past have when I have made some drastic mistakes. One year, based on someone else's shared experience, I left the boxes wet and put them in my basement. The wax moths not only destroyed all of those combs but so infested my house that I have never gotten rid of them. There have been wax moths flying around my house every since and that was in 2001. Never put supers, especially wet ones, in a warm place. Especially when you have the option to put them outside where they will freeze and the moths will die. My current method is this. I wait until late to harvest. The reasons for this are that I can better assess what I should leave for winter, thus saving feeding nearly as often, I save harvesting and then feeding, which is less work. I don't have to chase the bees out of the supers as I merely have to wait for a cold day when the bees are hunkered down and pull the supers which are empty of bees. After harvest I can put the wets on the hives and wait for some warm days for them to clean them up and after they are done, pull them off and stack them with no fear of wax moths as the weather is now cold and there are no moths around. If I want to harvest early, then I'd put the wet boxes back on and not pull them off until after a hard freeze. The moths, in my part of the country, don't really get going until about late July or August and I try to have all of that drawn comb back on the hives by mid June at the latest, where the bees can guard them. So, I have no moths in the combs during the honey season (June through September), because they are guarded by the bees. I have no moths in the combs from October to May because we get freezing weather now and then which kills the moths and the moth eggs. I have none from May to June because they moths haven't built back up from winter yet. What to do with an infested colony. The reason a colony gets infested is that it is weak. Prevention is not to give them more territory than they can guard, in other words, don't leave a lot of drawn comb on a hive that is small and struggling. Once they are infested, the solution is to reduce them down to just the space the cluster of bees can cover. Remove all the rest of the comb. If you have a freezer, freeze it to kill the moths, or if it's too far gone, let the moths finish cleaning it up. If they get to go to the logical end they will turn all the comb into webs that just fall out of the frames or off of plastic foundation. If it's only got a tunnel or two in it, freezing is a way to save the comb. I usually only have problems with colonies that have died out because they have gone queenless or gotten robbed out. In my management style, I find another nice thing about foundationless frames is you can give them to a hive and it's just empty space for future expansion, not all that surface area to guard from the moths as you have with wax foundation. Also nice in bait hives because the bees will build in the frames but you don't have wax moths tearing up the foundation. Some people use Bt (Bacillus thuringiensis) as either Certan or Xentari, on the combs. It will kill the moth larvae and seems to have no ill effects on the bees and studies have supported this view. 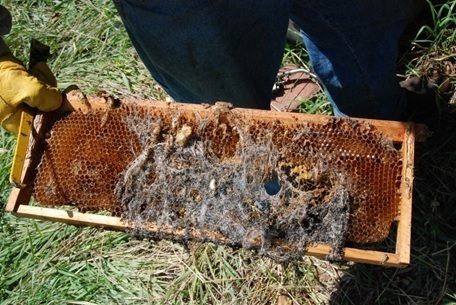 It can be sprayed on infested combs even with the bees on them to clear up the infestation. It can be sprayed on foundation before putting it in the hive. It can be sprayed on combs before storing them. I simply haven't had the time to do this in years now, but, as I say, my management seems to keep them under control except in failing hives. But it would probably help in the failing hives if I had it on the combs ahead of time. Certan used to be approved for use on wax moths in the US but the certification ran out and there was no money in renewing it, so it's no longer labeled that way in the US, but is available labeled for that use from Canada and available labeled for use against moth larvae (but not wax moth per se) in the US as Xentari. What I would do if I lived in a more tropical area where moths don't get killed by winter: I would put empty combs on top of strong hives so they can guard them. This isn't a good plan in a temperate climate. What I would not do, and is at the top of my list of things not to do, is use moth balls, particularly the Naphthalene ones. Slightly better, and on the FDA list as approved, is PDB (Para Dichlorobenzene). But both of these are carcinogens and I have no use for such things in my food supply, and beehives are part of my food supply. Click here for a study on PDB contamination in honey. I have given up hating wax moths, which is not an easy thing to do when you see them destroy the combs the bees have worked at building. The wax moths are just part of the ecosystem of the beehive. They do their work and it is probably useful work. They get rid of old comb that might have disease lurking in the cocoons. If you really do hate them and want to keep them even more under control, which I have given up on, you can make traps. Basically a two liter bottle with small holes in the sides and a mixture of vinegar, banana peel and syrup inside seems to work well. It also catches a lot of yellow jackets. The moths fly in the holes in the sides, drink, try to fly up and get trapped.